As far as the goods, monies, and estates pertaining to the Church go, the Stigmatine is like one of God’s Administrators or Book-keepers, with the servant’s “Power of Attorney” to some extent – appointed by the Church as His Estate Manager. St. Gaspar was convinced that the authentic “Administrator is the Church” [cf. Letter 119, July 20, 1827]. In this reflection, we will try to show the meaning of St. Paul’s idea of the “stewardship of the Mysteries of God”  [cf. 1 Co 4:9; cf. Dt 15] as applied to the Church’s handling of valuables. From there we develop a thought about St. Gaspar’s consistent mentality of gratuitous service: his non-acceptance of offerings from a Reverend Mother, Teresa Gamba; his [and the community’s!] non-acceptance of a deceased confrere’s [Fr. 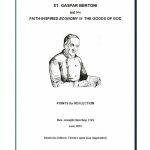 Francis Cartolari] substantial bequest; and St. Gaspar’s offer of all the community owned, first to the recently [re-instated] Society of Jesus – and then subsequently to Pope Gregory XVI. In all of this, St. Gaspar’s sublime motivation was to ask himself in what way would his administration most benefit the Church.